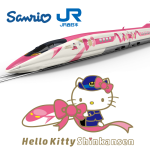 In a collaboration between West Japan Railway (JR West) and Sanrio’s popular Hello Kitty character, the Hello Kitty Shinkansen will begin operation on June 30 with the aim of revitalizing regional communities in western Japan. Source: West Japan Railway Company, Sanrio Co., Ltd.
Central Japan Railway Company (JR Central) and West Japan Railway Company (JR West) have released a new free smartphone app, the Tokaido Sanyo Shinkansen Reservation App, through which users may purchase tickets for the Tokaido Sanyo bullet train line, Japan’s main artery connecting Tokyo, Mt. Fuji, Nagoya, Kyoto, Osaka, Hiroshima, Hakata and other destinations. Japanese Prime Minister Shinzo Abe is coming to India on 11th December, and during his tour, he is most likely to finalise an agreement on high-speed train services in India, which means that India can soon get its first ‘Bullet Train‘. Larry Hogan just asked for $28M to develop a maglev train line between Baltimore and D.C.
Gov. Larry Hogan isn’t just riding a magnetic levitation train in Japan during his trade trip to Asia. His administration is boosting a private effort to build such a super-fast train at home between Baltimore and Washington, D.C.
BANGKOK – Japan has signalled its intention to help develop three multibillion-dollar high-speed railway routes in Thailand. Both sides will sign a memorandum of cooperation (MOC) this month on joint development of the Bangkok-to-Chiang Mai, Kanchanaburi-Bangkok-Laem Chabang and Bangkok-to-Sa Kaew rail lines. Prime Minister Datuk Seri Najib Razak today experienced first-hand the Shinkansen, Japan’s renowned bullet train which travels at 320km per hour. East Japan Railway Company officials are promoting bullet train technology in India in hope of developing a high-speed rail system there. EAST Japan Railway (JR East) has confirmed that it has been appointed as a consultant by Britain’s HS2 (High Speed Two), the company overseeing the project to construct a 531km Y-shaped high-speed network from London to central and northern England. One of Japan’s best-known icons would have to be its bullet trains or shinkansen which are a marvel of technological achievement. Central Japan Railway Co, better known as JR Tokai or JR Central, operates the Tokaido Shinkansen. Its high-speed rail technology is in demand overseas.